Chad’s squid with frying peppers. As we move deeper into summer our garden and the farmers market start to show an abundance of small “frying peppers”. Frying peppers make up a family of small, usually sweet, thin-skinned, peppers that start with a lovely pale green but will move to a deep red over time. 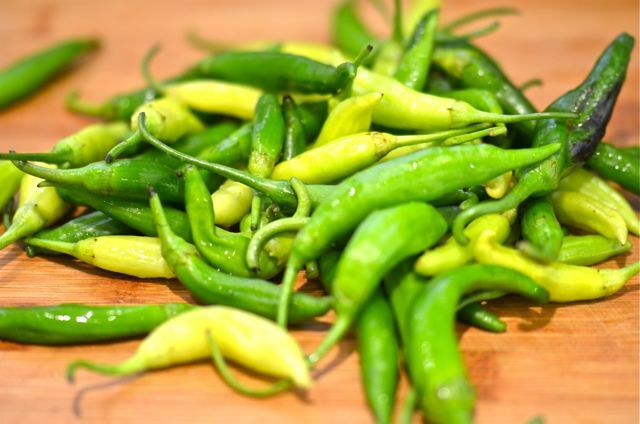 While they have a variety of names (Jimmy Nardello, Shisito, Cubanelle, Italian frying, or Padron) most frying peppers are best served in simple preparations that highlight their sweet, grassy flavor. 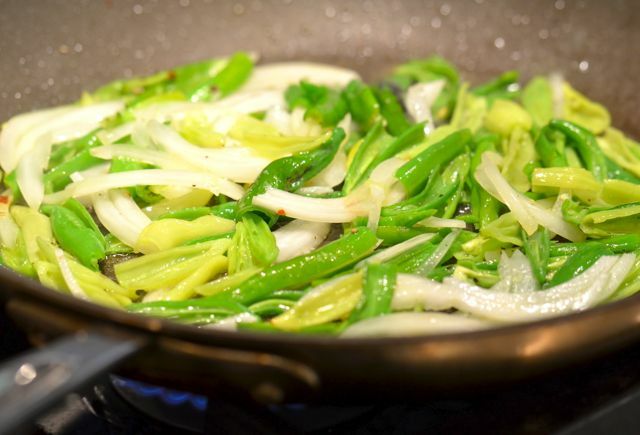 Many recipes simply suggest a quick, high-temperature fry in some olive oil and a touch of seasoning. That is a good way to enjoy frying peppers, and we do, but we also want to include them in main courses. Frying peppers, a real summer treat. Happily, our friend Chad (the professional chef and all-around good guy) made a simple, but incredibly tasty, recipe that combines squid and frying peppers. Chad made this last summer when peppers were in season and we couldn’t wait to try it again. 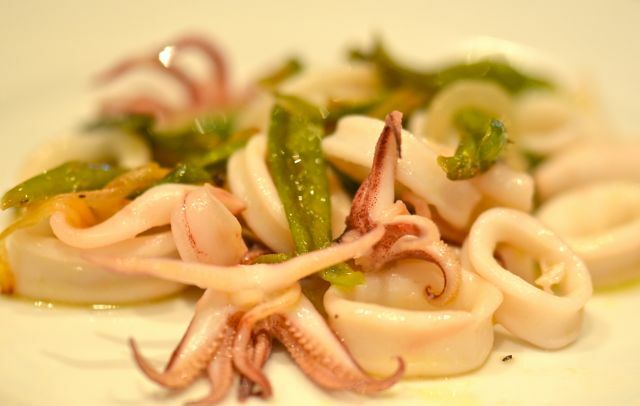 The recipe combines sweet, buttery squid with the more herbal sweetness of the peppers, a dash of lemon and wine (if needed) provide some acidity and suddenly you have a light, balanced and very addictive dish. And a dish you can serve as an appetizer or a main course. And it takes just a few minutes to make. Simple ingredients but great flavors and textures. And this weekend our peppers came in, and the farmers market was full of early frying peppers (we had to augment our Jimmy Nardellos, we will plant more next year). And in a stroke of good luck, the fish guy at the farmers market had frozen, cleaned squid available. So we decided to go ahead and make the dish. A few quick text messages from Chad (thanks!) to confirm the basics of the recipe and we were off to the races. But first, a quick note on preparing and cooking the squid / calamari. Squid are affordable, widely available and quite tasty, but can be intimidating, particularly when you have to clean them yourself. Our advice is very simple. Don’t clean them yourself. Buy them cleaned or have your fish monger do it, squid are still inexpensive even when sold cleaned. If you must do it yourself, here is a good link on how. Saute the peppers and onions in a bit of olive oil. Otherwise, the key to cooking squid is that it either cooks very quickly over high heat, or low and slow in a braise. This recipe is a quick / high-heat recipe. But this means that it helps to cut the squid into pieces that are the same size so they cook evenly. If you have uneven pieces, the small pieces will be tough by the time the large pieces cook. The squid are done when the pieces are opaque and the edges curl. The best way to be sure the squid is done is to simply try a piece after a minute of cooking and keep testing. If tender and buttery, it’s done, take the squid off the heat. The squid will still cook a bit more from residual heat. 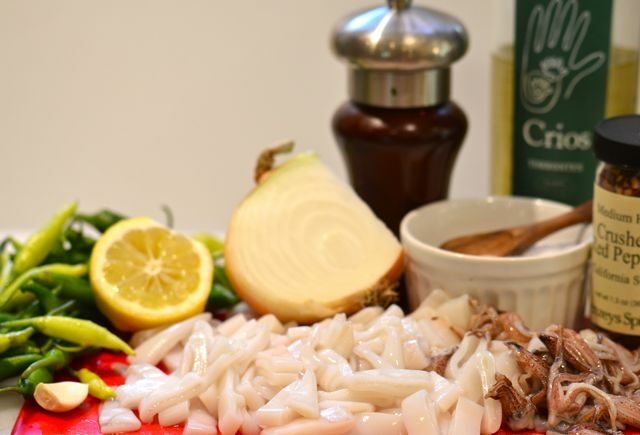 Quickly cook the squid with olive oil and a dash of lemon and wine. As for making the dish, it is a very simple preparation. Clean the peppers, slice and the remove the seeds. Sauté the peppers with a few slivers of sweet onion in some olive oil until the skins slightly blister, about 6-8 minutes, and lightly season. Meanwhile slice the squid and then fry, over very high heat, in some olive oil for just 1-2 minutes.The squid will release liquid that provides the base for a light sauce. Add a dash of wine, a squeeze of lemon and then add the peppers and onion to the squid. Taste for seasoning and add salt, black pepper and some red pepper flakes if you like a touch of heat. Serve with rice, pasta or some crusty bread. Combine the peppers and squid, season and serve. We enjoyed this dish as much as the first time we tried it. The squid was buttery and sweet and the peppers added incredibly fresh flavors. It simply tasted like summer. And it is a light and healthy dish as well. So if you have frying peppers this summer, the first thing to do is just fry and eat them. But if you want to use the peppers in something more, try this dish out, it’s a winner. Thanks Chad! There are many varieties of frying peppers, but you want small, thin-skinned peppers. Taste them for heat before you start the dish. Red or green varieties both work. Frozen squid are not only fine for this dish, but preferred. Freezing helps tenderize squid. 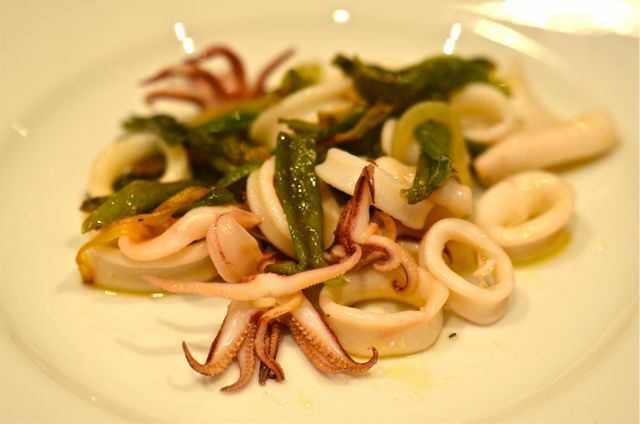 What You Get: A very tasty summer dish that combines squid and peppers. A light, healthy, but flavorful dish. How Long? About 15-20 minutes of mostly active time, assuming you are using cleaned squid. Most of the effort comes from slicing and seeding the peppers. Anytime dish. Cut the squid into evenly shaped rounds about 1/4 inch thick. If using the tentacles, remove the top section with the hard beak and discard. Rinse the peppers and then cut off the tops and slice in half lengthwise. Remove seeds from the peppers. Thinly slice the onion into strips. Place a skillet over medium-high heat. Add 2 tablespoons of the olive oil to the skillet and then add the peppers and onion. Saute the onions and peppers until the skin on the peppers blisters and the onions are soft, about 6-8 minutes. Remove from heat and set aside. Place a large skillet over high heat. When very hot, add the remaining 2 tablespoons of olive oil and then the squid. Cook for 1-2 minutes, stirring frequently. Taste for doneness after 1 minute. 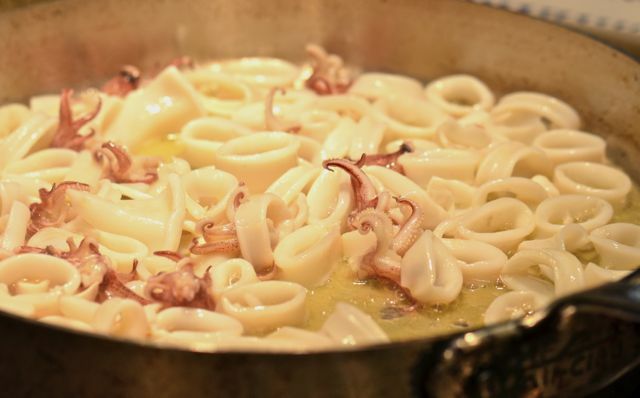 When edges curl and the squid are opaque, add the lemon juice and wine and remove from the heat. Add the pepper and onion mixture. Taste for seasoning and add salt, black pepper and red pepper flake to taste. Serve with pasta, rice or crusty bread. This seems very delicious! I will definately try when I get the chance! Thanks for reading. It is a great dish- hope you like it! This is a perfect dish for us – we love squid and it´s easy to get hold of here and our garden is now starting to deliver on the peppers…perfect! And an absolute perfect recipe – tasty, quick, simple, unadorned, my kind of meal! Frying pepper is sort of a generic term. They are usually sweet, but have herbal / grassy flavors like a bell pepper (maybe just a touch of heat). The cool part is the thin skins- they basically dissolve so the texture is much better than a bell pepper. I did a bit more internet research and here are a few varieties that may be available in the UK; Hungarian Wax, Volcano, Jimmy Nardello, Tequila Sunrise, Corno di Toro, Beaver Dam and Tolli’s Italian Sweet. The main thing is looking for a sweet, thin skinned pepper- hope this helps and thanks for reading! yes it does help, I think I know the kind of pepper you mean. I’m going to look at a couple of favourite websites to see what they have on offer – I sometimes buy some seeds from suppliers in the states (Baker Creek) so they will probably have some of the varieties you mentioned. Thanks again! I first read “frying” as “flying” and thought WOW! Even as “frying,” though it’s a beautiful recipe, and I suspect the deep pepper flavor with the sweet calamari is fantastic. I am SO cooking this!! This week!!!! I’ll let you know;). Thanks! I love squid although I prefer the non-tentacle parts. this looks really good. I’ve never made it on my own but I think I will make your recipe the first I try! Hope you like it and thanks for reading! Intresting flavors and recipe … love squid, but I have problem with it if not not deep fried. Don’t really know why, think it’s down to a dinner in St Malo, France – but I like everything about the ingredients here. Your photos are always stunning.